The Beatles 50 Years Ago Today: February 3, 1968. Beatles Radio: The Beatles, Solos, Covers, Birthdays, News The Fab 4 and More! The Beatles visit to India to study under Maharishi Mahesh Yogi was imminent, John and George flying out on February 15th, Paul and Ringo four days later. As they weren't due to return until late April, they decided to record a new single for release in absentia in Mid-March. As it happened, this concentrated series of sessions, ending on February 11th, was more productive than expected and realized four new songs, all mixed and ready for issue. The first of these was Paul's "Lady Madonna". 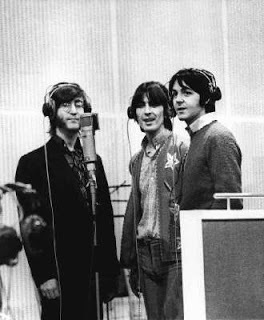 Three piano drum takes were recorded the Beatles overdubbed bass, fuzz guitars, drums and lead and backing vocals.